The rooms are all cozy and clean with a shower and toilets. Hair dryers and adapters are available free of charge at the reception. 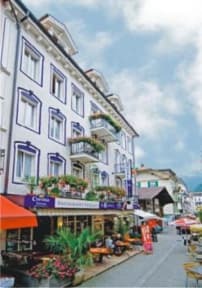 The owner welcomes you personally and will be delighted to advise you on activities and trips in and around Interlaken. If you are a keen biker do not hesitate to talk to Polo Rosas, he is a passionate mountain biker! He normally goes on biking tours in the afternoon and would be very pleased to take you with him and show you the nicest parts of the area. You can book any more adventurous activities (Rafting, Canyoning, Bungy Jumping, Paragliding ect.) at the reception. The restaurant EL AZTECA is a real Mexican specialty restaurant with around 20 seats and 10 bar seats. During summer there are an additional 20 seats on our pretty terrace. Next to our a la carte Menu we also have 5 good value 2 course lunches (Fr. 14.50-16.50) a Mexican and 4 international Menus (12h00-14h00). Small but charming. Our hotel rooms are appropriately fitted, clean and nice. They all have cable TV and an en-suite bathroom. Some of them have a beautiful balcony, which is decorated with wonderful geraniums in Summer. Since the hotel is in the center of the pedestrian zone, you will certainly not wake up because of the traffic noise. For very sensitive ears, we have also an extremely calm room with view on the backyard. Breakfast and taxes are included in room rates. Hotel Blume seems to be run by just one single smiling helpful lady. She checks people in/out, prepares the room, prepares the breakfast and gives local tour advice. She does a hell of a good job at it too. Rooms are sun-lit, cozy and spacey. 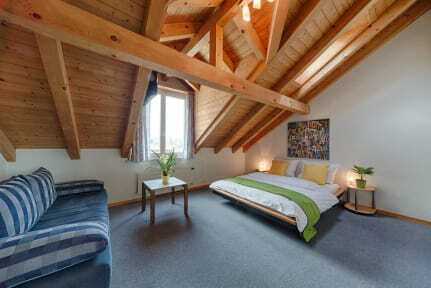 It's centrally located near West Interlaken with loads to shop and do nearby. Staff was extremely friendly and helpful, rooms were clean, what more could you want? We stayed in a private single ensuite. Bathroom was very clean, room was small but perfect getaway after some other hostels out there. Be aware that single rooms are a twin bed, but they did have a drop down bunk bed that we were able to use for 20€. Free breakfast was good, and staff was happy to make fresh coffee for us. TV in the room and a fan! Great for the warmer months in the summer. Great location and very friendly and helpful staff. There are not showers in the rooms but one on all the floors. I never had a problem when needing to use one. It’s a hotel not a hostel by any means but I enjoyed my stay and recommend booking here. Great location and friendly staff! Shared/communal bathrooms were very clean but made it feel more like staying in a private room hostel than staying in a hotel! Overall, good spot though! Good location and facilities. A bit costly for an accommodation with shared bathroom/toilette.